What do you call someone from Peru? What kind of animals do they have there? Do they speak English or another language? Hannah and Amy Go To Peru (Hannah and Amy Go To Series) by Sabrina Rizk is a non-fiction children's book about two sisters that travel around the world with their parents. Go with Hannah and Amy as they visit many places. Their first stop is Peru. Learn with them about the people, animals, and sacred sites of this fascinating country. What would it be like to travel to a foreign country? Ask sisters Hannah and Amy! Go on a fun and exciting journey through Peru and meet such fun creatures as Alpacas and Llamas. Discover the country's rich history and climb Machu Picchu with the girls. Learn how they speak in Peru and even what they wear. Are you ready to visit Peru? 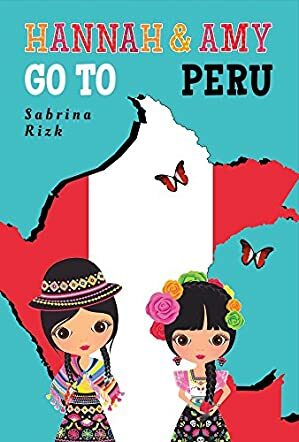 Hannah and Amy Visit Peru by Sabrina Rizk is the first book in the Hannah and Amy Go To series. Travel with the girls as they journey around the world in six months. With colorful pictures to engage the young reader and a relaxed, conversational feel, this book can help to teach the student while keeping learning fun. Complete with helpful pronunciation keys and a glossary in the back, this book is both educational and entertaining. This book could be used as a learning tool for younger children studying foreign countries. I would recommend this book to children ages 5-8.